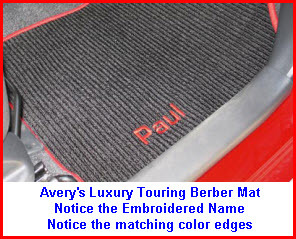 Averys Car Mats come in berber, luxury sport and 3 touring styles. 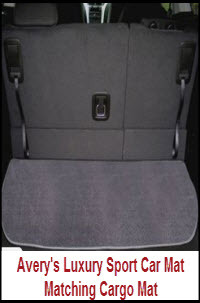 Averys Car Mats are manufactured by Avery's Floor Mats which is a division of Guardian Products Inc. Their car floor mat product line consists of basically four models; Touring, Grand Touring, Select Touring and Luxury Touring. Note: for additional info see our alternate page for Averys Auto Floor Mats. Averys Floor Mats has been making car floor mats since 1982 and has a great repertoire of carpeting, colors, edging and embroidery to meet the discriminating tastes of you, their customer. Averys Car Mats come in over 4000 different patterns, so they usually fit your vehicles floor pan like a glove. In fact an Avery's mat may just fit your car better than the OEM mats that came with the car. Remember to keep your car floor mats clean with regular vacuuming and an occasional wash job with mild soap and water. And, if you want to further protect these mats and increase their lifespan use some universal absorbent car floor mats. OK, let's get into the different Averys Car Mats and see which one you want. Averys Luxury Touring (LT) Berber is a type of weave that is tufted with both big and little pieces of yarn. A lot of times small flecks of dark yarn are tufted into a lighter shade of yarn to give the classic, luxurious, berber weave look. The carpet is really durable but if you get dirt lodged down deep into the fibers, it's kinda hard to clean. Avery's uses 42 ounce polypropylene blend yarn that's very durable and stain resistant. Marine quality UV protection helps prevent fading and a water resistant nibbed backing stops the mat from slipping on the vehicles floor. Avery's Select Touring Mats are made from thickly tufted nylon yarn and feature Stain & Odor Resistant technology just like the Yes Essentials product line. So stains like coffee, chocolate and other food stuff the kids dump on your car or van floor are repelled and easily cleaned up. And if you do miss cleaning up some of the smelly stuff, there's a silver based anti-microbial built in to the carpet fibers of these Averys Car Mats that prevents odors from forming. A non-slip composite rubber backing prevent the mat from slipping and cushions and insulates your footsies. 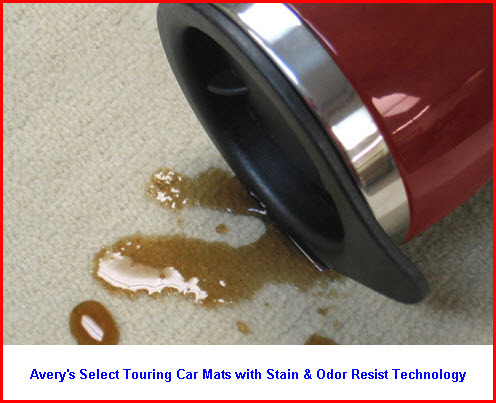 Avery's Grand Touring car mats are like the Select Touring product minus the stain & odor resist technology. If you don't have kids or other animals and are a clean freak, these Averys Car Mats will do for you. Avery's Touring Mats are designed to replace the original OEM mats in your car. They might be a little plusher, cover the floor pan better and impress your friends, but that's what you expect from Avery's. And with weather resistant nibbed backing, these mats won't slip and slide around on your car's floor. Note: As of 18-Nov-2016 it appears as if this product is no longer available from Averys Floor Mats. Kind of like the Touring Mats - but sportier and more economical. They come with nibbed backing. Custom fit to give an affordable touch to your vehicle and provide a thrifty alternative to more expensive mats. Made in USA.